Yesterday, a Redditor with the username Foxconninsider posted about a new Smart Keyboard claimed to be a working prototype potentially coming to both iMac and MacBook devices sometime in 2018. Created by Australian startup Sonder and displayed at an event in Tsinghua University in Beijing, the keyboard uses an e-ink display behind the keys of the board to dynamically change the input of the device to the whim of the user, which could range from different languages to social network shortcuts and emojis. I work on Tsinghua university campus, it is like the Chinese MIT. It hosted a Foxconn event where I saw the new Macbook keyboard module design and Apple's 2018 E Ink Magic Keyboard that's a DFT model. (DFT is design for testing). The startup Sonder makes a smart keyboard module, it has a new magnetic mechanical mechanism and a lit E Ink display which allows for swapping shortcuts and languages etc. I saw it swap between a few programs and languages (English, Japanese, Taiwanese layouts etc). The Foxconn Innoconn Executive said Apple's PBO (Procurement board office) was closing an acquisition for the startup company that is now registered in Hong Kong for a big return of investment for Foxconn International Holdings and E Ink Holdings. Aside from the unverifiable nature of the post, the claim is questionable for a number reasons, which together originally led MacRumors to decline to cover the story despite multiple contacts from the source prior to their sharing it on Reddit. Among the questionable aspects of the story is Foxconn's and Sonder's apparent willingness to confirm Sonder is in discussions with Apple about the keyboard technology. Such talks are typically covered by non-disclosure agreements which would preclude them from acknowledging the discussions. Today, however, The Guardian is corroborating the story with a claim that "separate to the Reddit report, The Guardian can confirm the Apple CEO, Tim Cook, met with [Sonder founder Francisco] Serra-Martins in China on Wednesday." Cook is currently touring both China and Japan, but The Guardian's confirmation doesn't give specifics as to whether the meeting was simply in passing, or specifically related to a potential acquisition deal. Regarding the technology at the center of the story, the original Redditor claimed that they "couldn't film the macbook or magic keyboard test units at the event," so the early demo keyboard shown in the video above represents a variation on what was seen at the event. The event's keyboard allegedly had a single e-ink screen for every key on the MacBook, along with a backlit lighting panel. 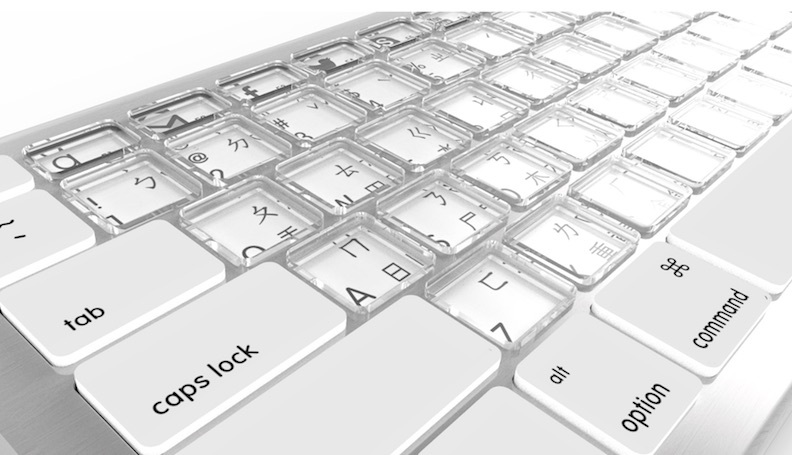 The technology would seemingly be used in future MacBooks and integrated into the iMac's Magic Keyboard lineup. With so many unconfirmed factors swirling around the story, it remains possible that Sonder itself is attempting to generate interest in its own upcoming Sonder Keyboard, which packs in all of the previously detailed e-ink technology, along with Mac compatibility, at $199. The company expects the keyboard to arrive sometime in the fourth quarter of 2016. Customizable keys have always seemed a cool idea, but in reality they're convoluted, gimmicky, over-fiddly, and over-priced for most users. Most users never mess with key mappings, custom key functions, or macros. I just want an Apple wireless *extended* keyboard, please. No. You need to read more about e-ink. This would be amazing technology, but not necessarily for the average user. However, I'm more inclined to think Apple will go with a glass touch screen, virtual keyboard, wi a Taptic Engine before they went this route, and that would definitely drain the battery much faster. But it would also offer an incredible multi-purpose interface for those who need it. $200 dollars with Sonder tax. I wonder what the price will be with Apple tax. That would be horrible. I've tried "touch-typing" on a touchscreen. Invariably my fingers start to stray the moment I take my eyes off the keys. Haptic wouldn't help that either. You need to be able to feel the edges of the keys and those dimples on two of them. Finally! The key that's been missing from keyboards for decades!!! I really want this to be real!! In combination with the OLED bar this could really reshape the way we interact with our keyboards. That keyboard looks horrible... oof. i wouldn't be interested in this at all honestly.